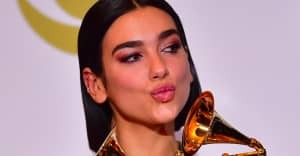 Dua Lipa announced on Tuesday that she will release a 'super-deluxe' re-issue of her eponymous 2017 album. The re-issue will include previously released single "One Kiss" with Calvin Harris as well as a collab track with all-woman K-pop group BLACKPINK. The song, titled "Kiss and Make Up," will be BLACKPINK's first-ever international collaboration. Lipa tweeted about the upcoming re-issue on Tuesday, expressing her excitement over the positive reactions from fans. "I’m so happy that you guys are happy! I was very excited about thissss but also sad bc it’s coming to an end. But also happy bc new music and new era!!" She wrote. Dua Lipa - Complete Edition will feature 25 total songs, and three new songs including "Kiss and Make Up." The album re-issue is set to release on October 19.